By Dale Carr, Founder and CEO of Leadbolt. It’s no surprise that mobile advertising spend is continually on the rise, as mobile devices now represent the most relevant screen in our daily lives. So much so, that next year TV advertising will no longer account for the majority of advertising dollars spent in the United States, according to e-Marketer data. According to BI Intelligence, digital and mobile Native advertising is set to surpass $20 Billion by 2018. As the mobile advertising industry continues to grow and evolve, so do the opportunities to deliver more meaningful, personal and highly relevant ads. App developers and publishers aim to deliver the best possible user experience, keeping app users happily engaged and returning regularly. This means protecting against intrusive and poorly delivered ads that could potentially annoy users, and at worst, lead them away from the app altogether. Yet, developers of free apps (which is most of the apps in market today,) rely on ad revenue to continue to flourish. Advertisers, on the other hand, aim to reach the most relevant and high quality mobile audiences, and often believe that the flashiest ad format will capture audience attention. The two agendas might seem at odds with each other, however, Mobile Native Ad placements are emerging as the mobile industry’s most effective middle ground, delivering exceptional results and giving both parties reason to celebrate. I’ll explain in detail below, but in short: Mobile Native Ads allow for a non-intrusive in-app user experience, while simultaneously filtering for audiences with a genuine interest in the ad message, yielding new customers with a higher lifetime value for the advertiser. The term “native” refers to the placement or mindful integration of an advertisement within its environment, not the ad format itself. Rather than a pop-up ad, an ad that floats across the screen, a graphic that overlays or blocks content, or an audio that may play unexpectedly, “native” ads intentionally blend into the design or function of the mobile experience. They are marked as “sponsored” and adhere to strict regulation by IAB. 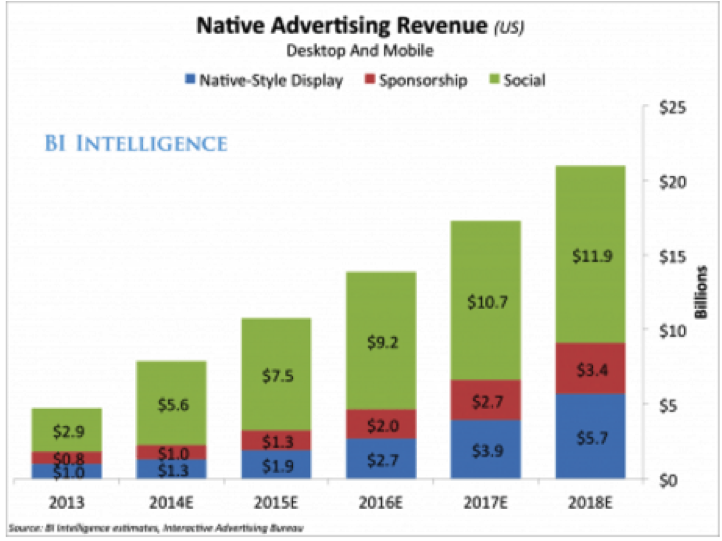 What are the Mobile Native Ad formats? The joy of mobile native advertising is that a native ad placement within an app can perform well with many ad types or formats. The truth is, one ad format is not inherently better than another. Each format has a purpose within a mobile marketing mix, since mobile users’ receptivity to ads changes throughout the day, depending on what they are doing in any given moment. It comes down to understanding when and where the user will encounter the ad, which is all about expert ad-delivery, and why the strategy of elegant native placements is so important. Savvy app developers allow for a variety of native placements within the app, and advertisers prepare a variety of creative assets in various formats to meet the demand. Mobile Video Ads – Storytelling at its finest with sight, sound, motion, and emotion! Mobile Rewarded Video Ads – Thanks users by granting in-app perks and rewards (e.g., coins, game level advancement, bonus game life, etc. ), in exchange for their attention to the ad. Mobile Rich Media Ads – Advanced features within the ad encourage deeper interactions with content. A newer example of this format is the “Playable Ad”, which gives users a chance to play or experience elements of an advertised game app directly from that ad; a trial before install. Mobile Display Ads – The most common versions are the banner, and full-screen static images with a call-to-action that are also known as “Interstitials”. Custom Native Ads – App developers and brands can partner to create custom content for the ad, that fits into the storyline or theme of a particular app (e.g., a branded character in the ad that looks like part of a game cast). A custom ad can be designed to match the look and feel of the app, incorporating specific colors, graphic treatments, exclusive fonts, and stylistic traits, so the ad itself is viewed as an extension of the app experience. Native music advertising is on the rise, as well, with Pandora and other music apps experimenting with sponsored songs, playlists and radio stations. For app developers who want to strike a balance between successfully monetizing your titles, and pleasing your users with a seamless app experience, mobile native ads are a great way to go. Integration is often made simple with a streamlined SDK or API. Don’t hesitate to ask the Leadbolt team for case studies and other tips to maximize your monetization plan. This entry was posted in Mobile Advertising, Mobile App Ads and tagged in-app ads, native ads, video ads. Bookmark the permalink. Hi there, I would like to subscribe for this blog to obtain latest updates, thus where can i do it please help out. Hi there, you can find “Subscribe Now” button in blog section.